Virtual Worlds will change the nature of who we are. This type of experience changes you, makes you demand change in the real world that is so easy to change in virtual environments…..this technology ends up changing us as people.” Philip Rosedale, Virtual Worlds 2007. Just pour yourself a drink, light up a cigar and ponder the implications of the “What you want machine.” Can you even imagine how your life [and the world] would change? I also want to compliment the artist on the user interface. Given the benefit it delivers… It’s an exercise in restraint. I agree with Gasowski on the elegance of the user interface. The only possible downside I see is the “What You Want Machine” will miss out on all the brand loyalty an arcane user interface produces with a good old fashioned hazing. “Real Life” Development Stories in the News This Week. 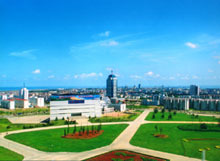 It is a city of nearly 3 million inhabitants and a climate similar to that of North Carolina. In the city’s central district, 99 percent of the houses use solar heating. 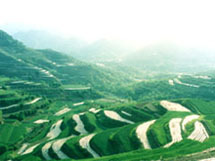 Six thousand houses have solar cooking facilities and 60 greenhouses use solar heating. And, so we must. But, the lessons will not always be easy or unidirectional. Boing Boing reported from a post on the Wired News blog Threat Level that “shareholders ask Google to counteract foreign ‘net censorship. In recent years, American internet companies have swooped into booming foreign markets and, occasionally, cooperated with repressive regimes seeking to crack down on free speech and democracy. The NYC Comptroller’s proposal attempts to limit Google’s ability to forgo internet rights that most of us take for granted. See previous posts on Boing Boing for the full story on Google, China, and genocide: web censorship and Tibet. Also see, Preserving Tibetan Culture: A Digital Cultural Library For All. These pictures are of the Dabhol power plant in India which was closed down five years ago in the Enron debacle. “Nothing quite captures India’s dilemmas ['fast growing but energy poor'] like the sorry tale of the Dabhol power plant,” wrote Vir Singh in IEEE Spectrum. It was announced recently that after years of problems (see timeline for Dabhol tangle) that India’s Dabhol plant will “run full throttle by Nov,” althougn only yesterday there was a report of the possibility of yet another delay. These stories caught my attention this week because they show that complex development issues don’t always lend themselves to chirpy optimism in real or virtual worlds. It is early days for virtual worlds, and as a metaverse evangelist (a job description that IBM has given cache to! ), unless you are an Ostrich, you cannot be unaware of reports of griefing, and corporate misunderstanding of how to participate in the developing economies of Second Life, and other issues of connectivity, stability, scaling and social instability in virtual worlds. I am torn here, because on the one hand what the Economist says here is true. I mean, although there are some countries on the continent which have made some tremendous gains over the last decade, as a whole the continent has a long way to go-politically and economically. However, on the other-hand, I ask myself why would potential investors and business people think any differently about Africa if this type of ambiguous reporting about Africa is all that they hear? Sure, the risk may be higher in a country like Ethiopia or Nigeria, but there are still some companies that do extremely well there-in spite of all of the other things that go on there. 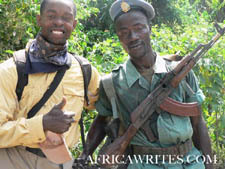 These pictures are from an African American internet entrepreneur, Patrick Gorham, who is pioneering a collaborative new media project called Africa Writes. 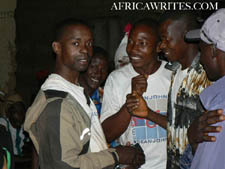 The Africa Writes crew don’t let the challenges of developing environments keep them from realizing their dreams. Nearly a year ago while filming near the border of Liberia in the deep forested mountains of Guinea, the AfricaWrites staff and I were honored to witness the Kissi ritual known as the Hiowolan, the dance of the Yokia (see video here). Although performed by the young males of the community, who were not of age or ordained Yokia, it was an impressive display of animal mimicry, acrobatics and defensive capability. Luckily, our low powered batteries held up during the incredibly dusty shoot. 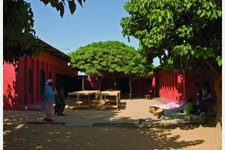 The mission of Ugotrade is not just to talk about innovative uses of technology in developing “real life” countries. I have decided to make a leap and treat virtual worlds as developing “countries.” I make this coupling, not just because I think virtual worlds have an enormous potential role in human development. But, also, because I think looking at some of the “real life” development dilemmas through the lens of virtual worlds will be helpful, and visa versa. Also, CEO, Philip Rosedale is unequivocal and passionate about opening up every piece of software, every line of code, “right down to the filesystem formats,” so that SL can become the basis for a 3D platform that could become “as ubiquitous a platform as the web is to us today.” (from speech on Second Life at the Life 2.0 convention, May 1st, see Metaverse). Virtual worlds have a huge role to play in positive global development – again see my earlier posts, if you are wondering how I arrived at this view. The short story is I first used ROA/Return on Awesome to describe the spirit I wanted to see come out Sheep Labs, the beta and R&D site that’s been bubbling up out of The Electric Sheep Company. Since it’s more of a sandbox space we need the freedom to pursue interesting ideas and ROA more than immediate ROI. When it popped into my head, I remember hearing someone somewhere present what I thought was a very poor idea which was defended because it would ‘provide good ROI’. Worse than defended, I could tell it was a very poor idea *because* they were starting from the POV of ROI. Not unusual, but it really made me think Gross! There is not ROI [return on investment] without ROA [return on awesome]! I hope to get updates from these three groups and talk to Sue Stonebender soon. 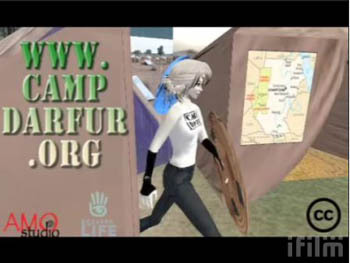 Also, I will follow up on Infinite Vision Media’s Social Responsibility Initiative that “offers high-end services to Second Life bound non-profits” (see story on Business Communicators of Second Life). 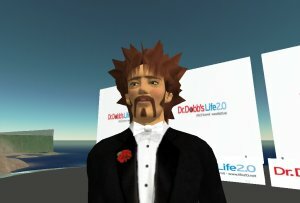 I met Sibley Verbeck, founder of The Electric Sheep Company right at the end of Virtual Worlds 2007. We were both too exhausted to talk! But, he kindly got back to me. And, Sibley will be doing an interview for Ugotrade on positive global development with an ESC perspective. 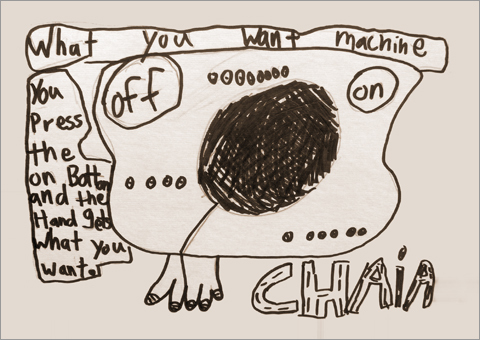 Thought Experiment #2: Think about Return On Awesome and take the “What You Want Machine,” for another spin. 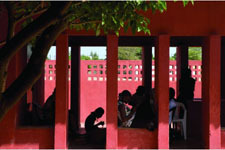 Click on these pictures to find out more about Open Architecture Network. This week, I talked to two digital marketing agencies, Clear Ink and Converseon who unlike say The Electric Sheep Company, Millions of Us and Infinite Vision Media, do most of their work outside of Second Life and other virtual worlds. But, both of these agencies have put up pro bono builds that impressed me (and Clear Ink more than one – TED Island, and Capitol Hill). Capitol Hill has been the site of much activity including, Rep. George Miller (CA) and Speaker-to-be Nancy Pelosi joining Joanne Colan of Rocketboom there, anti-war protests in February, and gatherings of Obama supporters in March). Clear Ink seems to be right in the ROA groove. Clear Ink works with Sun (see 3pointD for news on Sun’s new 3D ebvironment) and Autodesk in Second Life (sim opening today). But, I was prompted to visit Clear Ink Island this week mainly because I noticed they had streamed the recent TED conference into Second Life, and were responsible for the construction of TED Island (to be publicly announced this month). When I met Kiwini Oe, co-founder, EVP and chief strategist for Clear Ink inworld, I was very excited to hear they are discussing streaming Global TED, June, 2007 in from, Arusha, Tanzania, Africa. 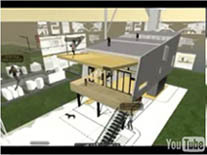 collaboration and participation in 3D environments, as well as the newly launched ‘Open Architecture Network‘ – which represents the fulfillment of Cameron’s 2006 TED wish. The event will feature a virtual version of the ‘Porchdog‘ and the Global Village Shelters – both of which are contributions to the Open Architecture Network. On the left is the Porchdog home. Real-life construction is part of Architecture for Humanity’s effort to provide housing relief and redevelopment in post-Katrina Biloxi, Mississippi. 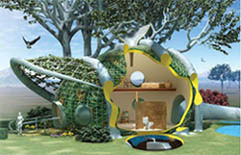 On the right is another of my favorite projects from Open Architecture Network, An Edible Home For Humanity. I spend a lot of time on this beautiful build last weekend – a collaboration between Converseon and Plant-It 2020. 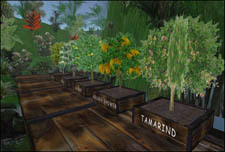 For the price of 300 lindens (roughly equivalent to US $1), visitors to Second Life can purchase and plant one of 10 species of trees on a designated island in the virtual community. Converseon payed for the build, and the island maintenance so that every tree here results in a tree in the real world. The planting of a tree in Second Life will trigger Plant-It 2020, a non-profit organization founded by the late singer John Denver, to plant the same species of tree in the endangered rainforest to which it is indigenous. The virtual island is accessible online at: Second Chance Trees. Luna Bliss - a virtual environmental designer, built Bliss Gardens, a huge seven sim nature reserve. Bliss Gardens provided the location for the Earth Day Hub. Luna Bliss writes: “We offer a unique perspective in SL – nature comes first and the buildings follow.” The beauty of the Second Chance Trees build may be a big part of its remarkable success. While I have no hard data, it is evident just by walking through the planting areas that many, many trees have been planted in only a few short weeks since the build opened. 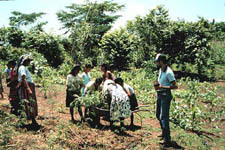 In fact, after I had planted my Tamarind tree, I couldn’t find it amongst the many other trees. But, one of the community of Crimson Star “furries” that support the sim, Idris Heroin spent a long time searching the note cards to help me find it again. I had a very interesting discussion on “immersion or augmentation” with Idris while we did this. I have been giving more thought to the “Augmentation versus Immersion debates“ – another post! And, when I returned the next day to talk to LLPlatypus, from Converseon, the “immersion” discussion continued with Skunk Spatz. A two decade veteran of the UK music and game industry, Laukosargas Svarog has built a functioning ecosystem in Second Life. For the more on this story see New World Notes. Laukosargas Svarog’s island of Svarga (direct portal here). I visited Xerox Innovation Island again to talk in depth with Jonas Karlsson, aka Poinky Malaprop, a researcher for Xerox, Webster New York and Karen Arena, Xerox PR. Xerox is one of a growing number of major league corporations who seem to be giving virtual worlds their full attention. The conversation began on the issue of stability of virtual worlds. Poinky was going through something a bit beyond feeling a little green on an ordinary bad hair day! 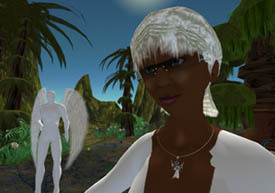 Xerox, and the PlayOn group at PARC (Bob Moore and friends) has been studying Second Life, and avatar interaction in particular, for a while. But now Xerox is starting to look at what applications they can develop for internal use as well as for external. We’re looking to explore ways in which Xerox can engage in the community as well, learn from the community……..
More on this at the Xerox Thought Leadership site from Sophie Vandebroek, Xerox Chief Technology Officer, (and a Second Life video). Rather than trying to target the right people or everyone, you setup a space so that the right people find you. ………One idea we are exploring is this notion of bringing customers into environments like these and exploring what new technologies they would like to see to solve their problems. These environments are so useful for interaction, so taking advantage of that and making the interactions easier and more valuable is very interesting. 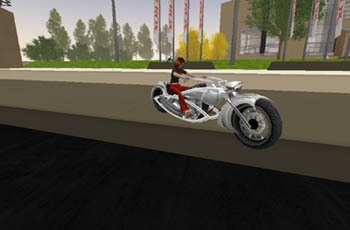 Here I am cruising around on my Nu-Ness bike inspired by the Xerox Nuvera digital printing systems. It is a specially commissioned 9-foot-long, black-and-white, chrome-covered custom motorcycle designed by Arlen Ness – one of the world’s most innovative customized bike builders. I’m not that concerned with the cautions listed by Gartner and others because I think the community understands how to deal with most of those issues. A lot of people cite instability, only being able to have 40 avs at an event, and adult or other disruptive content as reasons to be cautious. But, in day-to-day SL activities and events, I see those things being handled in various ways. So, I think we’re at the point (and Sibley and Reuben said this at VW07) to seriously start thinking about how to use these tools in an integrated way with our business and create value. In an earlier post, I mentioned Seven Digital Divide Fallacies from Digital Divide.org. Three of these fallacies may be as good to think with in virtual worlds as they are in real worlds. Three fallacies of digital divides that seem to apply to virtual worlds. 1) It is not a job for business or government [or "Gods" like Linden Labs or their equivalent] but both. 2) Not about choosing open source software over closed systems but both. 3) Not about bottom-up vs. top-down efforts but both. The amazing statistical presentations of Hans Rosling brilliantly illustrates how skewed and erroneously pessimistic many of the myths about global development are. I haven’t seen the equivalent kind of analysis done for virtual worlds. But, I am sure such a look might debunk many myths about development in virtual worlds too. Thought Experiment #3: Use the, “What You Want Machine,” to imagine a map of the online communities of Web 3.D, 2011. 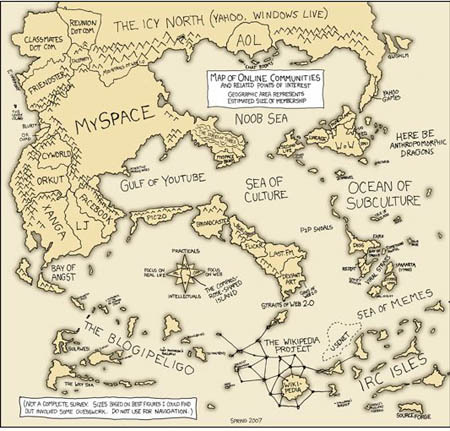 Here is the great map of the World of Online Communities in 2007 Kroosh posted that inspired me to think about this. Amazingly informative post! The part about Patrick Gorham has piqued my interest. Thanks for providing his link and excellent work! The Gartner report is extraordinary and the quote mentioned in your piece, “Find enthusiasts within your enterprise and support them.” should not be applied only to business, but to educators first. Sadly, I believe that educational use of MUVEs like Second Life will not be available to most teachers and learners until someone is willing to batter some doors down. Or until litigation and fear are eradicated from our society.